Check out my latest workshop offerings and new collaborations that I’m pretty excited about! Open to all, this community presentation aims to raise awareness about the thousands of untested and unregulated synthetic chemicals in everyday household products and offers practical solutions to help families create a healthy toxin-free home. led by Olivia Lane of Olivia Lane Housekeeping & Organizing! Let’s face it: You’re busy and you like to have fun. Housework is time-consuming and you have 10 million things you’d rather be doing, that is, if you could stop tripping over the same pile of stuff on your way to do them. Attend our workshop and learn not only how to fit housekeeping into your full and fabulous life, but learn how adopting a happy, eco-friendly housekeeping practice can make your life even better. Olivia will offer practical, personalized advice on how you can say goodbye to clutter and hello to all the good stuff you really need, want, and deserve. She’ll also share her secrets for making cleaning and organizing a sacred, self-healing and renewing ritual you’ll actually look forward to! Liz will explain how the products we clean with impact our health and our environment. 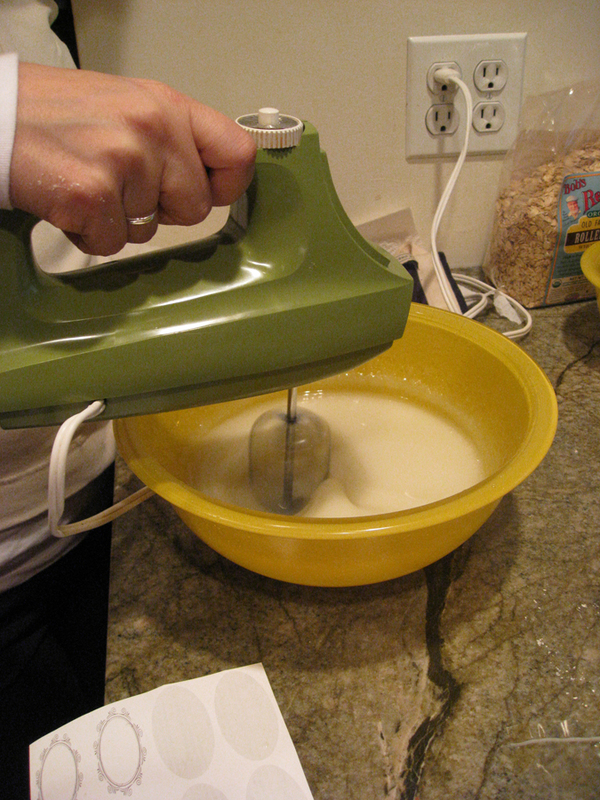 She’ll also demonstrate how to mix our your own homemade cleaning product. Participants will leave with a mini-guide to eco-friendly housecleaning, a homemade cleaner, and a fresh perspective on life, love, and dust bunnies! Please bring a small 4oz jar. Olivia Lane is a professional apartment cleaner and organizer offering creative, positive, and personalized eco-friendly service to Prospect Heights, Crown Heights, Park Slope, Bed-Stuy, Clinton Hill, Fort Greene & Lower Manhattan. Visit www.olivialanehousekeeping.com for more info. hosted by The Good Life’s Melissa Danielle! This workshop begins at 10:30am. You are invited to join us at 10am for a light potluck brunch. 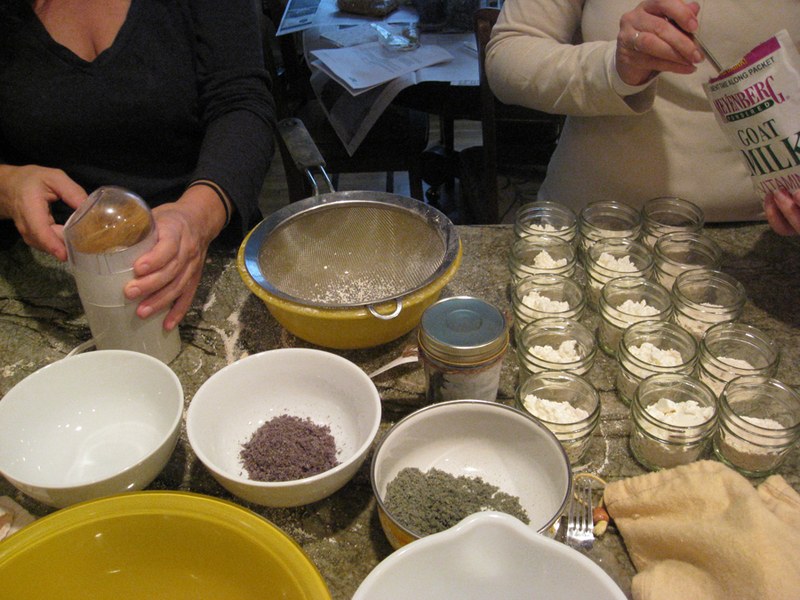 Are you ready to get crafty making luxurious lotions, polishing cleansers, and other body care products? In this hands-on workshop, you’ll learn the simple art of mixing up your very own customized goods that enhance your natural beauty. Many of the ingredients we’ll work with can be found in your cupboard, or are easily located at your local grocery store. Everyone walks away with 3 products (all-over body cream, facial cleanser, body scrub, deodorant; subject to change). Please bring: three 4-oz. glass containers (mason or baby food jars work great.) We will also have containers on hand to purchase if need be. Attend my workshop and learn not only how to fit housekeeping into your busy, fabulous, fun life, but learn how adopting a happy housekeeping practice can make your life even better. I’ll offer practical, personalized advice on how you can say goodbye to clutter and hello to all the good stuff you really need, want, and deserve. I’ll also share my secrets for making cleaning and organizing a sacred, self-healing and renewing ritual you’ll actually look forward to! Participants will leave with an original, handmade mini-guide to eco-friendly housecleaning and a fresh perspective on life, love, and dust bunnies! Suggested donation: $12; pay what you wish. No one will be turned away. I am passionate about helping people design balanced and fulfilling lives built around their own ideals and I use housekeeping and organizing as a tool to assist people with this. When our homes are unkempt and uncomfortable, it only makes sense that we too feel a little out of control and uncomfortable. The foundation of my housekeeping and organizing philosophy is to stay creative and positive. It’s not about how clean or organized your home is now; it’s about how clean and organized you’d like it to be, and I can make it happen! I work with clients to discover and co-create the kind of environment they are happiest in. Whether you need me to help unearth a closet full of New York Times dating back to the 1970s, visit regularly to keep things “just so”, or simply spruce up after a party, I can help make big or small domestic changes that will make you feel great at home and empower you to do great things out in the world. 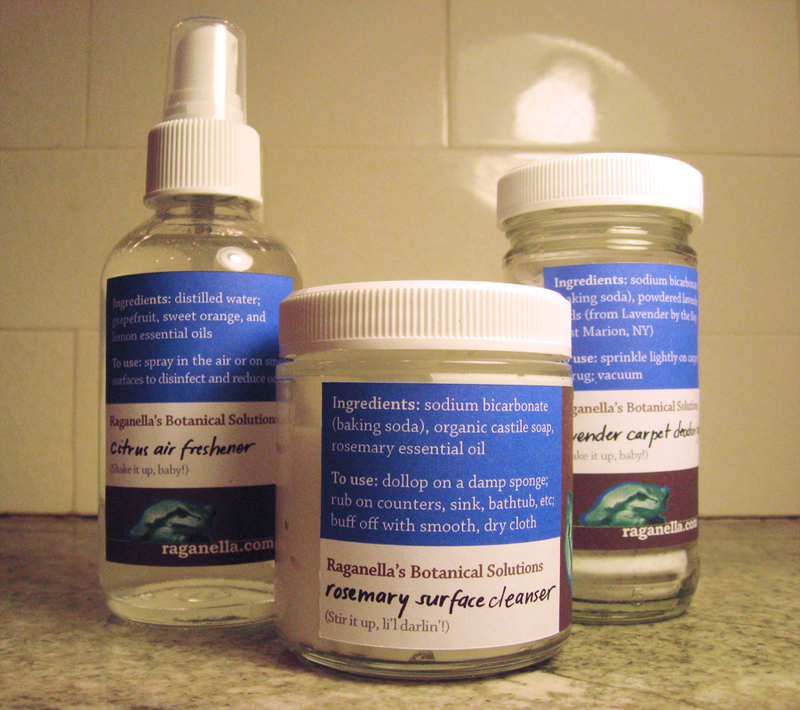 I use only natural (non-toxic and biodegradable) cleaning products that are not tested on animals. I also use recycled and re-purposed materials whenever possible. Serving Prospect Heights, Crown Heights, Park Slope, Bed-Stuy, Clinton Hill, Fort Greene & Lower Manhattan. Stay tuned for full details! And the people in the house will have sweet, sanitised smells. Their perfume, their talc, their underarm deodorant, their shower gels and shampoos and conditioners and hairsprays will all be strong and probably intensify as they mingle on skin and hair. You will deodorise your shoes, socks and feet with things scented with strawberries and blackcurrants and mangoes. You will sit at dinner and eat your roast, or your delicate pea soup, or your rosewater sorbet and vanilla cream to the accompaniment of a candle which penetrates every fissure and fold of tablecloth and napkin and nostril with strong incense, myrrh, patchouli. If these were sounds they would be a cacophony. As with sounds, you are inured to it and turn up the volume. Women don’t wear ghosts of fragrance any more – Floris bluebells, lavender water. They assert themselves with Opium and Poison, the swooning, insistent scents of the artificial paradises of the decadents. Perfume masks. Smell is direct. We are losing functions – we don’t recognise, we don’t detect; it is all ersatz. Ants, as EO Wilson discovered and described, communicate and organise their complex societies with odours and pheromones. We also recognise – or used to recognise – good and bad food with our noses. I know the smell of tainted meat or fish, or mouldy sprouts – but I believe our senses are being blunted by the chemical haze we choose to live in, like living in a constant buzz of high-level interference, snow on the television screen, just audible screeching on the radio to which we have had to become inured. Taxis increasingly have swooning smells, too, from sanitising tutti frutti to lingering pot. There is legislation against decibels, which seems to do little good, or else I am prejudiced by being too old and too accustomed to hearing myself think. I have friends who are allergic to perfumes. The effect of the delicately perfumed loo paper on sensitive tissue is better not described. I have a scientist friend whose lab door bears a notice forbidding students or visitors to enter wearing perfume as it gives her migraines. I met an elegant professor from Yale who said her husband felt that she shouldn’t wear perfume because it was intrusive and impolite. Read the rest if you’d like. The sense of smell is an underappreciated and underutilized gift we all have, unless you have anosmia. It can be a life-saving tool – think fire. It can be arousing, in the case of pheromones. It can trigger salivation and hunger pangs if there’s an enticing aroma of something edible. It can be a bane, in my case, if subjected to heavily perfumed or artificially scented persons, places, or things. And like most of the senses and experiences of life, it is subjective. One person’s favorite scent is despised by another. Right now, my favorite is the floral-citrus essence of pomelo. Scent is strongly tied to memory, having the ability to temporarily shake us out of the present like a subtle time machine. The aroma of baking, a reminder of grandma. A whiff of perfume, an old friend or love. The aura of woodsmoke, the first crisp day of Autumn. The distinct smack of band-aid, a big fall you had as a child. The formidable stench of lilies reminds me of funerals. The piercing shock of moth balls of my Aunt Norma’s basement (of a house she no longer inhabits). We all have these memories scent-linked memories. What are yours? You guys smell better to me than artificial fragrances. In the last post I touched upon why I don’t like certain “eco-friendly” cleaners (like Mrs. Meyer’s, Method, and Simple Green) because they contain synthetic fragrances. (Find out why.) I promised this time that I’d focus on solutions to this problem. But wait, didn’t you just say you didn’t like Method? Nope. I just don’t like the scented Method because they use “fragrance oils,” a synthetic fragrance ingredient. The CitraSolv line of products uses only essential oils in their formulations. No pervasive, stinky perfumes. This is the dish soap we use at home. Great for countertops, stovetops, and sinks. If you don’t have Bon Ami on hand, baking soda will do. A subtle scent of pine is all you’ll find in this all purpose household soap. Even more gentle than Sal Suds with no scent at all. You can customize it with your own essential oil blend if you wish. My own. Of course I’m biased here, but I know what’s going into the products I make. You can make them, too. Here are some recipes. What do you think? Are you bothered by fragrances? Do you love them? Could you be suffering from olfactory fatigue? Please do comment! Mrs. Meyer’s does not smell like this. I generally don’t like to slam products. I’d rather focus on solutions than problems. But when there’s a general perception that something is eco-friendly or healthy, I want people to know the whole story. This is a post I’ve been wanting to write for a while, and a friend’s recent query spurred me on to finally do it. Said friend asked me to offer some advice on choosing an eco-friendly house cleaning service. There were a few contenders on the table, including both nationally known and local companies. To me, aside from all of the obvious criteria for choosing a service (reliability, trustworthiness, thoroughness), the biggest question that would set cleaning companies apart is this: which products do they use? I’ve always suspected Mrs. Meyer’s soaps included artificial fragrance because a) the scent on my hands did not go away quickly b) I could taste the scent through my nose, c) the scent made me nauseated. While in the privy of one of my favorite restaurants (lots of local & sustainable NYC restaurants love Mrs. Meyer’s), I decided to peek at the label to confirm my suspicions. Right there, plain as day, was the ingredient I was looking for: Fragrance (Parfum). When I see that ingredient without any footnotes explaining its derivation, I begin to question the validity of the rest of the product claims. Why do I care so much about synthetic fragrance? 1. The fragrance/perfume industry is protected by patent or trade secret laws which allow them to hide any and all ingredients in their formulations. I don’t know about you, but I like to know what’s in the stuff I’m washing my hands with or spraying on my kitchen countertop. 2. Fragrance can be made from any combination of petroleum and non-petroleum derived substances, including formaldehyde, benzene, and toluene (I don’t think Mrs. Meyer’s includes any of these). 3. This potentially toxic soup can have any number of untoward effects on human health, including reproductive and endocrine disruption, immune system effects, and neurotoxic effects. I trust my senses first, but when I want a little confirmation for my concerns, I turn to the Environmental Working Group (EWG) cosmetic database. It’s not without its flaws, but I find it helpful when I’m unsure about the safety of particular ingredients. In their assessment, Mrs. Meyer’s products range from 3 to 6 on their 10-point hazard scale (that’s moderately hazardous). The caveat here is that, without knowing the actual composition of the fragrance chemicals the Caldrea company (maker of Mrs. Meyer’s) use, EWG applies the worst-case scenario fragrance to all products. It’s easy for me to unfairly single out Mrs. Meyer’s (as I did in the title) because she’s got a friendly name and image. But sadly, she’s not the only green game in town that has this vital flaw. 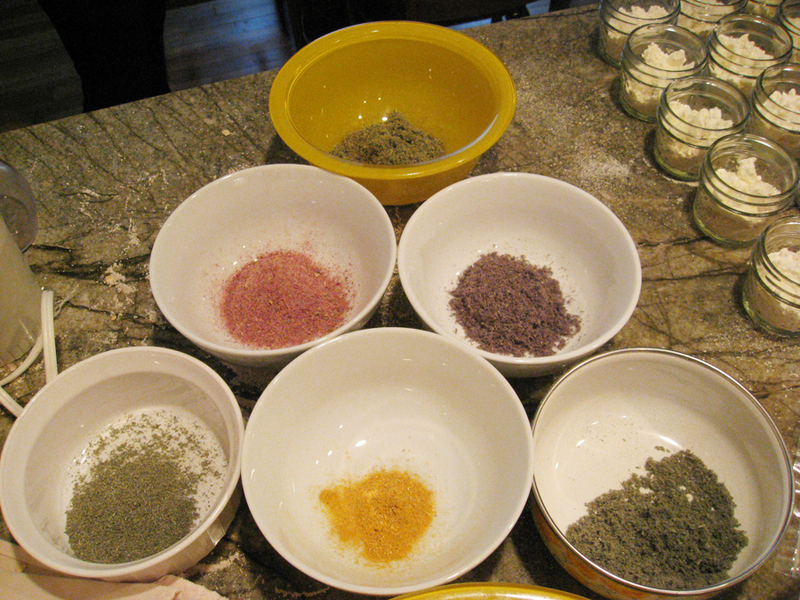 Her partners in crime also include Simple Green and Method (whose products also include artificial colors). Just because something is Green Seal certified (ahem, Simple Green) does not mean it is healthy, it just means it is not considered to be detrimental to the ecosystem. I care a heck of a lot about the ecosystem, and the one I care most about is yours. In this last post from the Smart Mama, she refers to a study where Mrs. Meyer’s was found to contain high levels of 1,4 dioxane, a carcinogenic solvent. Mrs. Meyer’s has since corrected this problem. You can read about it here. As I mentioned, I like to use my senses. In our culture of sensory overload, it can be difficult to distinguish harmful from healthful. It’s easy to dismiss the way we feel (our gut or intuition) because there are so many external influences affecting us. The good news is, once we start eliminating these influences, including all of the artificial scents and flavors, the line between what’s toxic and what’s not becomes a bit clearer. Life begins to smell (naturally) sweet again. Stay tuned for part 2 of why I think Mrs. Meyer’s stinks: synthetic fragrance-free solutions! Right now I’m recruiting members and asking for some initial input, mostly on the most convenient pick-up locations and times and which products they’d most like to see in the share. In the 3-month beta version of this CSB, members will also provide valuable feedback so that I can shape the program to best suit their needs. Interested in joining? Contact me via email liz (at) raganella (dot) com and I’ll send you an application form. 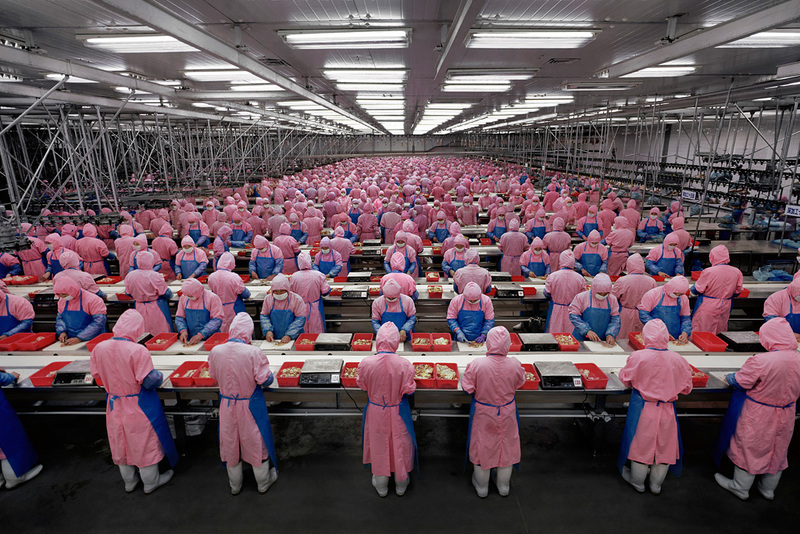 Or at least parts of it were and then they were assembled, packaged, transported, and sold by humans. And every thing you (and I) have in your possession required energy – extracted and refined fossil fuels which require energy – to extract, manufacture, and transport it. Likely, part if not all of these things were made in China. And likely, part if not all of these things will end up back in China in the form of waste to be taken apart by human hands. And the ships that transported them to and from their new home and eventual grave were made in China by humans. 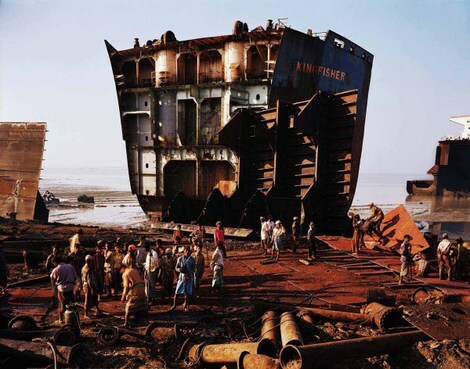 And those ships go to die in Bangladesh where they are disassembled by human hands (and often by barefoot men between the ages of 18 and twenty something). This monotonously unfolding chain of events is the subject of the documentary Manufactured Landscapes, which I finally just watched (it had been on my list for a couple of years). It may sound boring, but it is visually stunning and truly eye-opening. With minimal dialogue, the film shows us the work of Edward Burtynsky who has been photographing landscapes since the 80s. In a sense, the film is a culmination of his work as he delved deeper from extraction of earth materials all the way to the end of the line for the products and ships created with them. Of course, through this culmination we see the real impact of these activities. The film sure got the wheels in my brain turning about this world we’ve manufactured. We’ve not only physically changed the way the landscape looks, we’ve changed the quality of the air, water, and soil. It’s the type of film that motivates me to reconnect with nature, to stop supporting a destructive economy, and to keep talking about what we need to do to move humankind in a more positive direction. I hope you’ll get a chance to check it out. 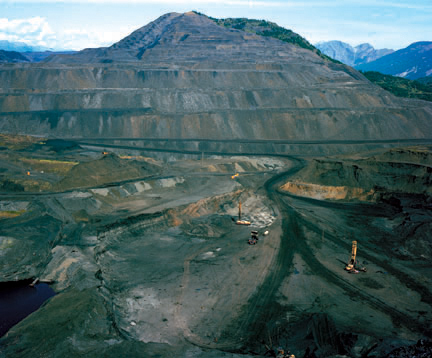 In the meantime, here is Edward Burtynsky’s TED talk about the film and the trailer. I want to let you in on a little secret. Making your own cleaning products is ridiculously simple. And fun. So simple and fun that, I guarantee that once you start, you won’t go back to buying the stuff off the shelf anymore. Even the good ones (Seventh Generation, Ecover, Simple Green) you’ll probably end up leaving behind. Here are just some of the benefits of making your own: you’ll save money, you can reuse the bottles (no wasted packaging), you can customize them to your liking, the ingredients are recognizable and non-toxic, and you’ll feel good about creating (instead of consuming). Same goes for making your own body care products. Plus, they make great gifts. So how does one get started making their own products? Well, you can look up some recipes or pick up a good recipe book like Better Basics for the Home or Earthly Bodies & Heavenly Hair . Or if you live in NYC, I can teach you how in the comfort of your own home. Better yet, invite a few friends over and make it a party. A make-it-yourself party. You choose whether you want to make cleaning products or body care products and I’ll provide everything you need to create. Everyone walks away with 3 customized products, plus additional recipes and info on where to find ingredients. All that for only $30 per person. Book both a cleaning and body care party and your fee (as the host) for one of the parties is free. The labels on your jars might be a little different, but the contents will look very similar to something you’ll make. I made these products as a promotion for Green Mountain Energy, a wind energy company based in NYC (and Texas). You might run into one of the Green Mountain reps out on the sidewalk in front of your favorite health food store or at a craft or eco fair in the near future. And maybe you’ll see some of these little products there, too. So grab some friends and pick some dates and give me a shout and we’ll work it out: liz (at) raganella (dot) com. In a shipping container in the backyard of Roberta’s restaurant in Bushwick, Brooklyn is the home of Heritage Radio Network – an internet radio station dedicated to spreading the good food gospel. 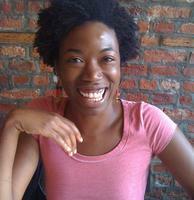 My friend Nicole Taylor (aka Food Culturist) hosts a show on said station. It’s called Hot Grease (knowing she’s from Georgia, it’s apropos). A few weeks ago, I was on her show, with an air date TBD. Well, while I was off on my digital detox, the program aired. I only found out after sifting through my emails last night. You can listen to the interview from the Heritage Radio Network site or via podcast on iTunes. Since it’s only about a 15 minute interview, we didn’t dig too deeply into some of the subjects. So after you give it a listen, see below for more info on some of the stuff we discussed. For more on the Eco Libris Green Books Campaign, check out the review I wrote of Participating in Nature: Wilderness Survival and Primitive Living Skills. Read all about the Brooklyn Green Team’s No New Clothing Challenge here. The New York Permaculture Meetup Group. Anyone can go to one of their meetings, held the first Tuesday of every month. 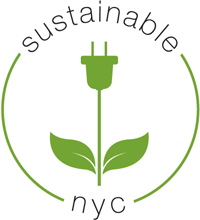 Meet some great people and learn about the cool ecological projects happening in and around NYC. 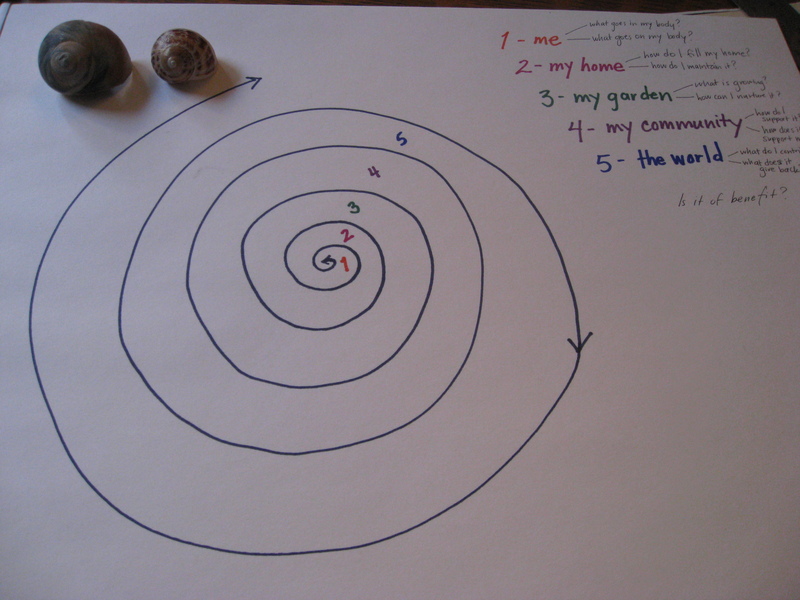 To see my design project for the Permaculture Design Certification, check out this post. Okay, I don’t think we discussed these, but we should have. 😉 I’m now offering make-it-yourself beauty and cleaning product parties. You supply the people and place and I’ll supply the rest ($30 per person). Everyone walks away with 3 customized products and recipes to try at home. Email me for more info: liz (at) raganella (dot) com. Five simple things you can do to lead a healthier, more ecological lifestyle. 5. Take off your shoes as you enter your home. Easy enough. 4. Bring in plants. 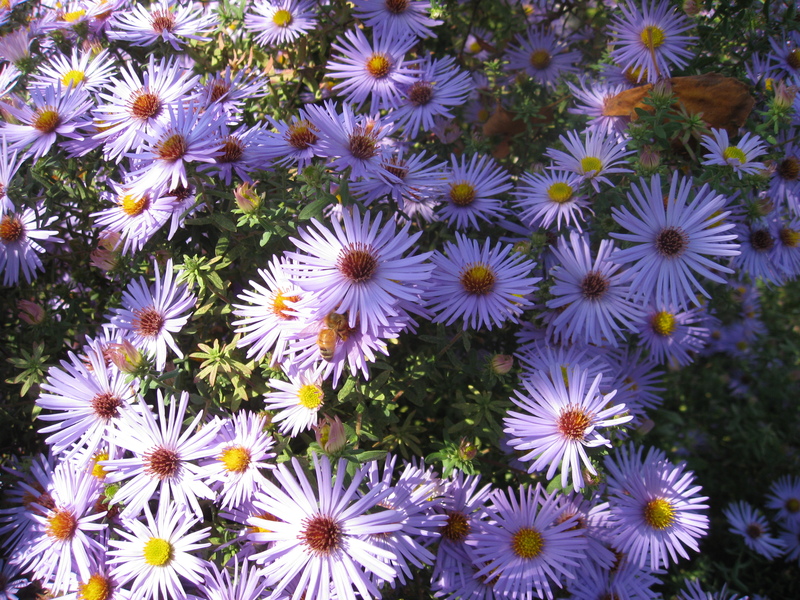 Learn more about the amazing filtering ability of plants. 3. 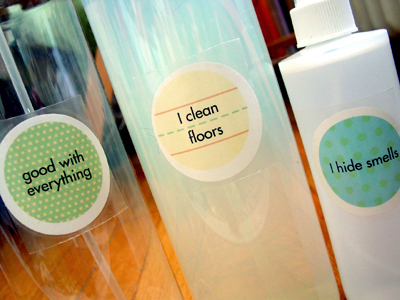 Swap out your cleaning products. Check out the Berkeley Ecology Center’s simple cleaning recipes or try these botanically based formulas from the Herb Companion. 2. Swap out your beauty/hygiene products.Earthly Bodies & Heavenly Hair by master herbalist Dina Falconi is a book I constantly refer to for inspiration in making my own beauty products. 1. Compost. Check out the NYC Compost Project for tips on composting. Find all the places to compost in Manhattan on the Compost Green Map. This site isn’t quite populated with enough data yet, but FindAComposter has potential to offer people across the country with a go-to source for finding a place to compost. No email. No internet. No computer. For 5 days (starting midnight tonight) I will be away from my trusty laptop. I’ve done this before and I’ll do it again. It serves me well on many levels. It centers me. It keeps me focused on what’s important, especially what (or who) is right in front of me. And as the emails clutter my inbox, I will remain unaware. When I check them at the end of the week, I’ll get a sense of what kind of info I’m gathering and perhaps unsubscribe from the unnecessaries and prioritize the rest. Separate the wheat from the chaff so to speak. What makes this digital detox a “deluxe” is that I’ll also be doing a 5-day yoga cleanse. I’ll be simplifying my diet (no meat or dairy, nothing heavy, fried, or too sugary) and practicing 2-hours of cleansing yoga every morning. It’s quite a treat (and kind of a birthday present to myself). I’ll be back soon to let you know how it goes. Enjoy the week!